the big brand sale - up to 80% off! 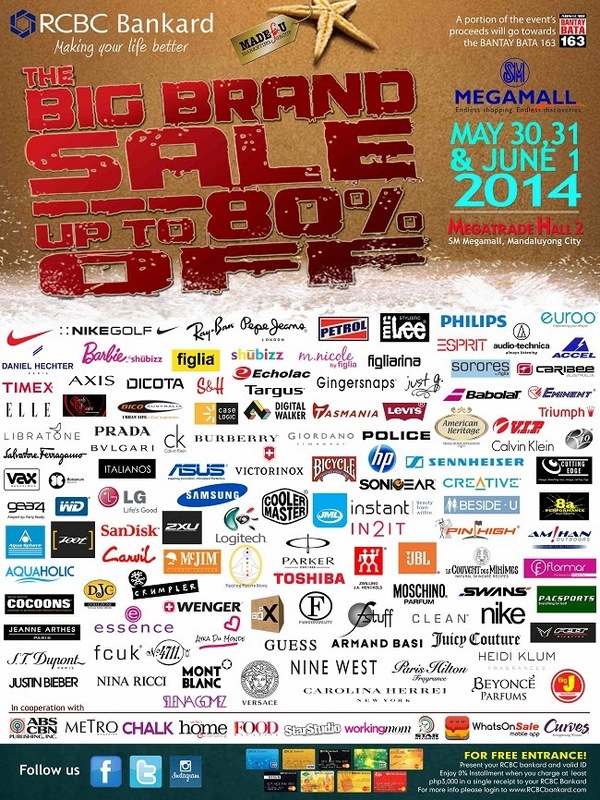 THE BIG BRAND SALE at SM Megamall's Megatrade Hall 2 this May 30,31 and June 1, 2014! Enjoy up to 80% off on highly coveted brands such as Nike, Ray-Ban, Pepe Jeans, Nine West, FCUK, Gingersnaps, Esprit, Case Logic, Guess, Samsung, Philips, Giordano, Just G, Wenger, Shubizz and many many more! It's the perfect time for smart shoppers to finally indulge while at the same time getting the most bang for our hard-earned buck, not to mention, the ease on our conscience since part of the event's proceeds will be going to Bantay Bata. There's something for everyone so make sure to take the whole family along, camp out (?! haha, I plan to go super early before opening to avoid the crowd) and flex those credit card muscles! Speaking of credit cards...Get in for FREE when you present your RCBC Bankard at the door + enjoy 0% installment when you use it to charge a minimum of P3000 on a single receipt purchase!